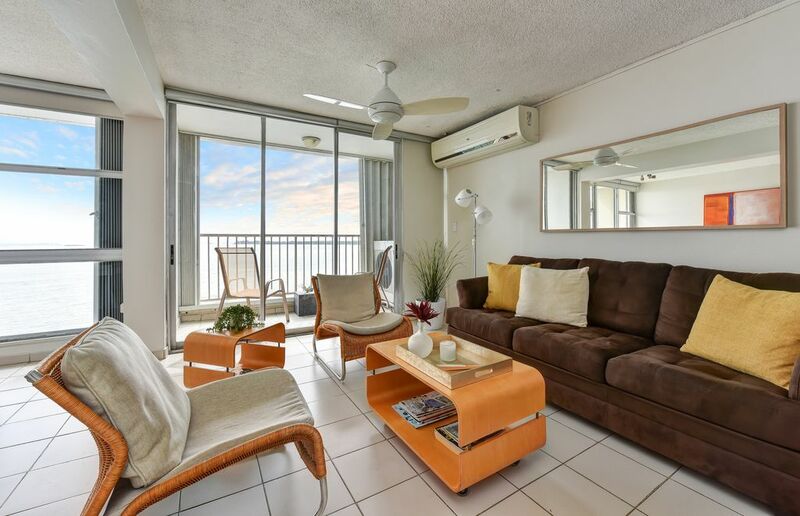 Stylish Open Plan Penthouse Condo (formerly one bedoom) on San Juan's most exclusive 3 mile stretch of silky sand beach features 180 degree ocean views. Just $99 per night through December 20th. Peak season rate (December-March): $125/night or $875/week. This furnished & fully equipped open plan penthouse with balcony is ideal for couple, but can sleep up to 4 people. Sofa sleeper sleeps two and bed sleeps two more. Wall of windows with fabulous sunrise & sunset views. Brand new designer kitchen features granite & stainless. Secure assigned parking space (accommodates compact cars only). This upscale condo is perfectly located on premier stretch of beach between the Ritz-Carlton & the Intercontinental Hotel. Walking distance to fashionable casinos, restaurants and entertainment. Other amenities include: Cable TV, VCR & CD player. Main floor coin-operated laundry. This is the property owner with her little friend, Camila, after a snorkeling lesson right in front of the condo. Doesn't get any better than that! My personal favorites are: over 3 miles of sandy walkable beach; gazing at the storks flying by in the morning; floating; the full moon rising; and drinks at La Playita next door. The apartment was everything we expected and more. You cannot top the view! Within walking distance to a lot of restaurants and a grocery store. We will definitely be back! Great apartment with everything you need. The best location with amazing views. Will make this my regular place to stay whenever in the San Juan area. Amazing views and beach location. As I have returned from my first visit to Puerto Rico I am sure it won't be my last and a big reason is because of the ease of working with Hebe during my stay. Not knowing what to expect when I arrived I was more than pleased to discover the studio was as nice as the pictures depict. The closeness to the airport got me on the beach so quickly I'm not sure how one could be enjoying the wonderful water any quicker. As I was planning my agenda, Hebe was so helpful in suggesting a few "must sees" and I really appreciated her promptness in replying. When it became time to plan my departure Hebe was again so accommodating to my schedule for checking out it made it so easy. Do yourself a favor and book your trip to this beautiful, well-appointed property today and enjoy the island life. The owner was very accommodating with check out and check in times. She met us at the property and as soon she opened the door to the apartment we were in awe. The view is beyond incredible. We loved waking up to the sound of the ocean. The studio was very clean and the kitchen had everything we needed. The parking is tight, but we were able to manage with our Toyota rental. The area is great and the direct access to the beach was perfect. The beach With direct access was less crowded, but it’s about a 3 min walk to get to the isle verde beach, where there is a lot of activity! We enjoyed having such Convenient access to both. The studio is in close proximity to Walgreens, restaurants and a grocery store. We absolutely loved it and we will definitely be back! The condo was clean and convenient to beaches, restaurants and a supermarket. We arrived much earlier than anticipated and Hebe was so accommodating - we were able to get into the condo earlier than check in time and she even brought us the the market! She was always just a text away but we never had a problem. The condo overlooks the beautiful water and the sound of the surf, night and day, was very relaxing. We didn’t want to leave! On the beach; Walking Distance to Casinos!